In an increasing but strictly unintentional trend, the number of non-fiction books I read this year continues to outnumber those of the fictional persuasion. Quite the reversal of my reading habits of a decade ago. The last two books I finished have both been non-fiction, both in the science realm. Richard Preston sure knows how to pick fascinating topics. You may recall how compelling I found his earlier book, The Hot Zone, which dealt with the search for the source of the Ebola virus. Panic in Level 4 revisits that topic in one of its chapters, but there is surprisingly little redundancy in the current writing. Obviously it is a topic of endless fascination. Equally, if not more, fascinating are Preston's chapters on the search for pi (in particular that of the brothers Chudnovsky, mathematical geniuses who built a super computer for that purpose in their New York apartment), the race to sequence the human genome (in which millions were rapidly made and lost in the resulting biotech bubble), and the little-known story of the grotesque and heart-breaking Lesch-Nyhan syndrome, a chromosomal defect that results in victims self-cannibalizing. I was reading the latter chapter at the hairdressers and almost lost an ear when my hairdresser, scissors in hand, looked over my shoulder to see a photo of a Lesch-Nyhan victim. The irony would have been exquisite. Only one chapter in this book drags somewhat. 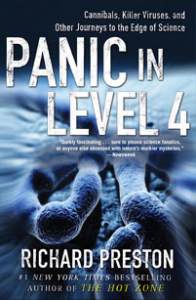 The devastation of the eastern hemlock by the introduced parasite, the wooly idelgid, is a disturbing cautionary tale, but lacks the fascination factor of the other topics that are investigated in Panic in Level 4. I am always puzzled as to why some people add their academic credentials to their signature. I can see the purpose of doing so for this book. My Stroke of Insight is geared toward the layest of laypersons and the addition of Ph.D. lends credence to the tale that unfolds within the pages. When I first heard of its existence, I was very curious to read this book. Having worked in neuroscience for thirteen years, specifically in stroke research, I was keen to gain some insight into the actual experience of stroke from a neuroanatomist who had suffered a hemorrhagic stroke. So when a friend gave me this book some years later, I sure looked forward to reading it. My Stroke of Insight is divided into three sections, pre-stroke, stroke, and post-stroke. The pre-stroke section includes simple and well-written neuroanatomy lessons. Aside from the unavoidable nomenclature, it avoids jargon and is a good introduction (or refresher course) to neuroscience. The stroke section, in which the author describes with uncanny clarity the sensations that she experienced the morning of her stroke, was nothing short of riveting. Obviously Bolte Taylor pieced together her experiences considerably after the fact, but she manages to bring an immediacy to her story. It is in the post-stroke section of My Stroke of Insight that the book begins to lose me. The timeframe of the story begins to skip around so much at this point that I was never certain whether what was being divulged happened days or months after the stroke. But that was relatively minor. The story of Bolte Taylor's heroic efforts at rehabilitation was quite astounding, both in the effort involved and even more so in the gradual refunctioning of the neural circuitry that had been damaged by the stoke. By the last few chapters, however, Bolte Taylor gets all mystical and loses me. I understand how an event like a major stroke would make one reexamine the meaning of one's existence, but the endless talk of tapping into the peacefulness of her right hemisphere and becoming part of the cosmos was just too touchy-feely for me. I wanted science, damn it! Overall though, My Stroke of Insight is worth reading, especially if you stop before it gets too annoying. Oooooh! Pannic in Level 4 sounds right up my alley. Still haven't read Hot Spot...somehow its no longer on my wish list. I'll remedy that right away and add this new one! Great review. I think you'd really enjoy both Panic in Level 4 and the Hot Zone, Karen. Science sure can be highly entertaining. 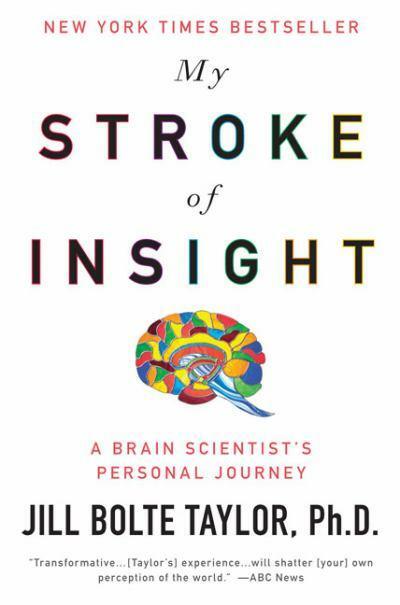 I just heard the other day that Bolte Taylor had written a book on her stroke experience. I had watched her TED talk sometime last year and thought that was fascinating, but it flowed much like you describe the book and gets very emotional/mystical toward the end. While I think there is definitely a place for that and I could see how she couldn't help but share that part of the experience, I, too, wanted more science. I felt quite miserly not getting all caught up in her joyousness and mysticism, Lesley, because I could certainly understand how she felt that way. But it was just too much for me. There's a horrible, irresistible fascination, Vicomtesse. I really like the sound of that first book. I haven't read a lot of non fiction lately, I should change that. Thanks for the recommend! Parts of it are not for the squeamish, Al, but it is fascinating. I read her book a number of years ago. I also lost interest in the book partway through and found it hard to continue. The information given is exceptional and I think this book is a must read despite it's issues. Agreed, Kathy, the first half of this book is riveting and valuable. Not so much the last bit.